2007. That’s the last time the Liberal Redskins have defeated the Garden City Buffaloes. 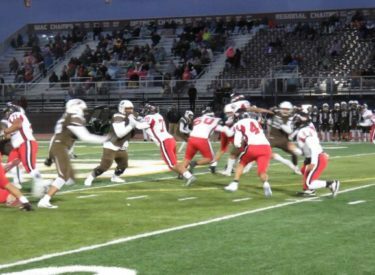 Garden made it 11 straight over their once fierce rivals 32-6 on a cold night at Buffalo Stadium in Garden City. It’s also Garden City’s seventh straight win over Liberal in Garden City. This was never a close game. The Buffaloes led 18-0 after one quarter and 25-0 at the half. Liberal did not score until the 1:41 mark of the fourth quarter. Garden City’s quarterback Carlos Acosta began his assault on the Redskin defense with an 11 yard TD to Tye Davis set up by a 48 yard strike to Davis earlier in the drive. John Aung blocked the extra point. The first score came at the 8:00 mark of the first quarter. Acosta drilled a 36 yard TD pass to Caleb Lapointe at the 5:18 mark for a 12-0 lead. Acosta threw a ball into double coverage with :19.6 to play in the quarter and Davis raced 86 yards for a touchdown and the rout was on. Davis followed that up with an interception of a Syrus Dunlap pass. Avey Arana’s TD run with 3:50 to play made it 25-0 in the second quarter. Acosta then intercepted another LHS pass. The Redskins gained a sliver of hope when Elijah McCarter recovered a fumble after a punt hit a Buffalo player. But Liberal’s offense failed to take advantage. Reece Morss’s four yard TD run with 3:50 to play in the third made it 32-0. Davis intercepted a pass for Garden City’s third interception of the night. Liberal finally scored when Elijah McCarter raced 58 yards for a touchdown. He carried four times for 82 yards on the drive and had about half of Liberal’s 169 yards in that one drive at the end of the game. Garden had 396 yards of offense including 249 through the air. Liberal is 1-4 and 0-2 in the WAC and Garden City is 2-3 and 2-0 in the WAC. The Redskins host 1-4 Wichita East Friday at 7 at the Cornelsen Sports Complex with Redskin Pre-game at 6 on 1270 and kscbnews.net.